Kel-Tec has redefined the definition of Bullpup with this RDB Downward Ejecting Bullpup rifle. For a true ambidextrous experience, the gun can be effortlessly switched from your dominant to non-dominant hand and not interfere with your performance. Get your very own from GrabAGun today for the cheapest price online! 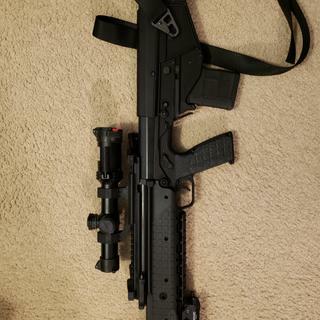 Interested in a bull pup.. and I already have the ksg..
Like Keltec rifles and have always wanted a bullpup. Does it include the angled foregrip? No it does not include the angled foregrip. Does the bullpup require special mags? BEST ANSWER: No, the RDB uses regular 5.56/.223 mags. I have personally only used 10, 20 and 30 round mags and the 20 round works best for me. No... any standard AR-15 mags will work. Any AR15 mag will work. No hiccups after 1000 rounds.. recoil is almost nothing, and field strip is very similar to an AR..
Good day. Great product. Easy transaction. Great gun and lots of fun. Excellent balance, mobility, lightweight and minimal recoil. Have put about 400 rounds through this gun without a single issue. Highly recommend to any gun enthusiast. Being a lefty, most bullpup firearms eject the brass in my face. This one has a rather ingenious downward ejection which makes it truly ambi. adjustable gas for shooting suppressed... awesome. Works well. And speaking of shooting suppressed... being a lefty the gas blowback into my face on most AR's is just awful when shooting suppressed. This has NONE... its just awesome. cheap plastic handguard can be replaced with a m-lok (much more useful and comfortable. This does NOT come with the magpul foregrip as showing in the picture... it should be grayed out as well. So far this weapon is what I would expect from Kel-Tec as I have purchased four Kel-Tec guns previous to this one.